Nothing ruins a photo trip more quickly than getting a camera bag stolen. Street crime is on the rise in many locations favored by photographers, and pro camera bags have become something of a target. 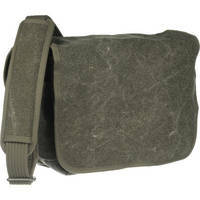 Fortunately, ThinkTank has come to the rescue with a low profile set of bags under the Retrospective product line. I used one of their new ThinkTank Retrospective 7 bags as my primary shooting bag on my photo tour to Southeast Asia last month and wasn’t disappointed. It held both my Nikon D6OO with 24- 85mm and 70- 200mm zooms as well as my Full Spectrum Nikon D7OOO, SB-900 flash, and a variety of filters. Adding pouches on the ends allowed me to also carry my Sigma 12- 24mm zoom and a water bottle. My 10" tablet fit nicely in the padded back pocket (it is large enough to fit an 11” Macbook Air or Microsoft Surface Pro), and various accessories rounded out the spaces in the front porch. As always , I appreciated the dual-mode Velcro closures for the top flap. When I was in crowded, public settings I could leave the Velcro active to make it difficult for the flap to come open accidently or be flipped open, while for quiet temples and ceremonies I could silence them and flip the flap open easily. The bag's narrow shape also made it a no-brainer for storage on just about any vehicle -- be it boat, van, or regional airplane. That made for one less thing to worry about when moving between locations. Note that if you are going to need 2 DSLRS always at the ready, the Retrospective 20 might be better as two of my clients had. In my case I often had took my second camera out, put a lens on it, and had it on a tripod, so the 7 worked fine. If you do get the 20 note that it has a smaller & less padded tablet pocket though. After three weeks of overloading, banging around, and many hour a day use in a dusty environment the bag still performed perfectly. The ''corduroy" type cloth does pick up some of the dust, but it only helped to make the bag look well loved. For use with a single DSLR, a couple lenses, a flash and some other accessories, it was perfect. Most days when I shot with two cameras I had to adjust to the fact that the bag isn’t really designed to hold two assembled prosumer DSLRs with lenses. I wound up storing the second body and lens separately in the bag, then put it together and kept it on the tripod so the bag was still the ideal size. Only when I had to stash two DSLRS in the bag was I inconvenienced by needing to store the second one separate from its lens. For keeping two cameras at the ready I recommend the Retrospective 20 that Greg and Marc, two of my clients, used that way throughout the trip. 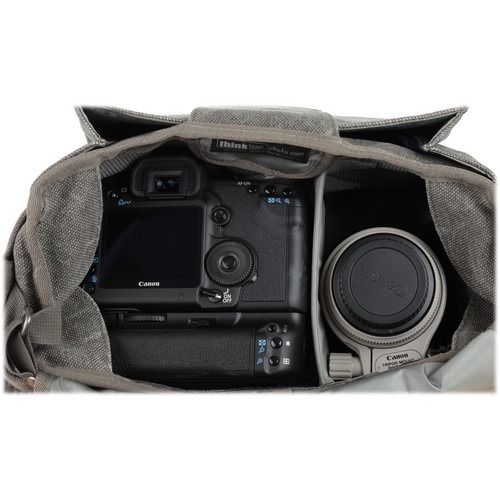 I don’t think I’d try to use this bag with two ‘huge’ DSLRs (like the Nikon D4 or Canon 1D X). If you have that much gear you’re better off with at least the ThinkTank Retrospective 30 or even something larger. Whichever bag you order, one of the great things about the ThinkTank Retrospective product line is the color choices. My bag is a light blue (Pinestone) which makes for a great change from all my black camera bags, and of course makes it less conspicuous. Like many shoulder bags, the Retrospectives do not include a “slot” for easy carrying on the handle of a roller bag. Maybe it is just me, but I wish every bag had that. It doesn’t matter for street shooting, but getting between locations always involves multiple bags, and if one is a roller then stacking them reliably is incredibly helpful. The Retrospective bags are soft. That’s mostly a good thing, but it does mean that (unlike the ThinkTank Urban Disguise briefcases) it doesn’t always stand up on its own. So it can fall over when set down depending on how you load it. There isn’t a waist belt waist belt so can be a lot for one shoulder when loaded. 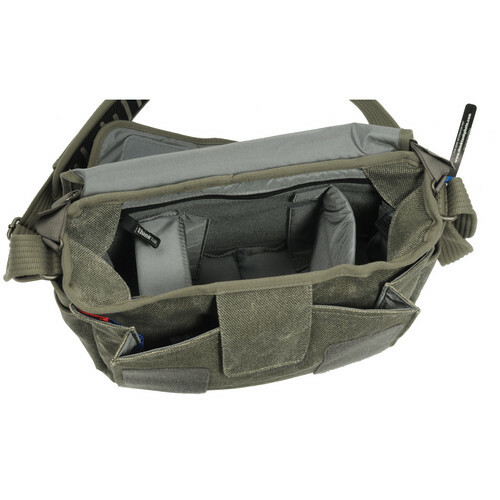 If you want a more field-centric bag that (with a couple extra pockets) can serve a similar purpose but has a waist belt, look at my field favorite, the ThinkTank Speed Freak 2.0. The end pockets are solid, so they won't stretch to accommodate a flash or water bottle like on some other models. In my case I solved this by re-using some of my belt pouches from my other packs. If you’re looking for a low-profile bag that can still carry the gear you need for most street shooting, the ThinkTank Retrospective product line is a great match. The narrow shape of the ThinkTank Retrospective 7 in particular makes it a joy to maneuver in tight spaces. I was able to add on pouches at both ends when I needed to “load up” with as many as 4 lenses, 2 DSLRs, a flash, a tablet, some chargers, and a water bottle. If you need a more formal looking briefcase with more internal support, the ThinkTank Urban Disguise products are worth looking at as an alternative. Or if you are going to be doing a lot of walking or trekking, you might want to evaluate the ThinkTank Speed Freak 2.0 which includes both a shoulder strap and a waist belt that can accommodate additional gear.